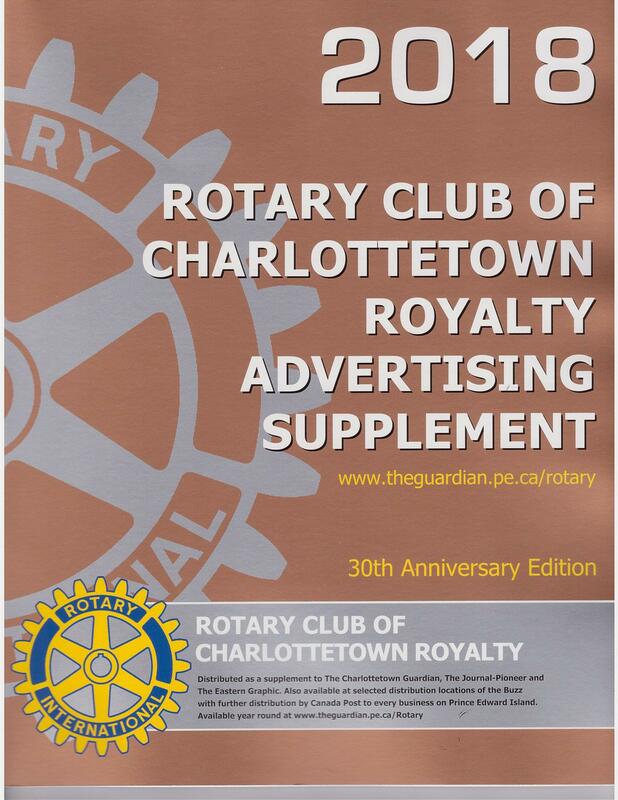 The Rotary Club of Charlottetown Royalty meets every Wednesday morning at 7:15 a.m. at Rodd Charlottetown Hotel. Our Club held its charter meeting on June 13, 1987 with Tom Wilkinson as President. We tend to have lively, interesting meetings with great speakers who discuss a variety of topics. 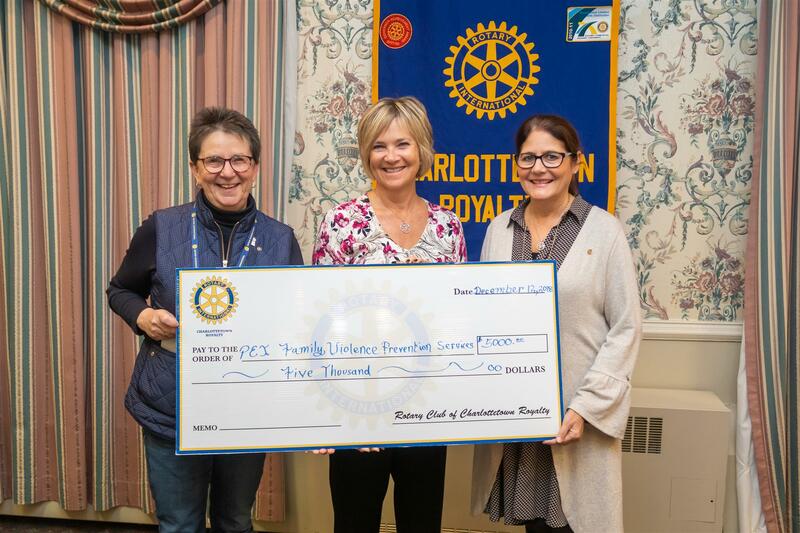 As a service club [one of 35,000 Rotary clubs worldwide] we raise funds through various projects and use these funds to make improvements in Charlottetown and around the world. Our main fundraisers are the Business Advertising Supplement and the QEH Foundation Golf Tournament. 100% of proceeds raised from our activities go to local community and international projects. Each year, thanks to the generosity of Bev Simpson and John Barrett of Veseys Seeds company, members sell approximately 150 boxes of flower bulbs which are provided to us free of charge by Veseys. 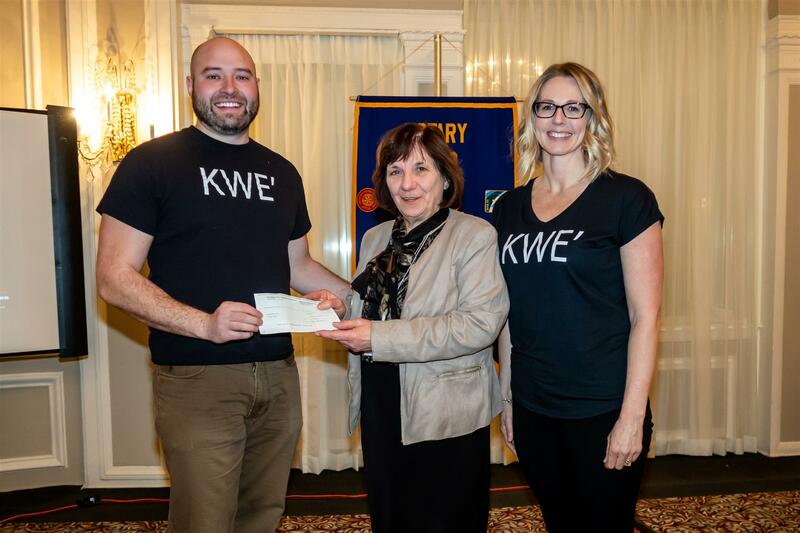 The $3000-$4000 raised annually from these projects go directly to our Rotary International Foundation to be used in our world-wide Polio Eradication campaign. Of course, as most will know, Rotary International has a significant investment in world youth and facilitates the one-year Rotary Youth Exchange program. Our club has consistently participated in this program for over 30 years by sponsoring at least one Island student going to another country each year. In addition, we accept an international student each year and provide them with host families, counselling, transportation, and members provide numerous activities throughout the year for our inbound student. This year we are delighted to have as Rotary Exchange Student Manuella Cabezas from Columbia, South America. You are most welcome to join us on Wednesday mornings. If you would like to attend a meeting, to see what our meetings are like, send us an email. Our club is honoured to support the Aboriginal Sport Circle in their holistic approach towards sports and in keeping with their values of caring, sharing and fair practices. 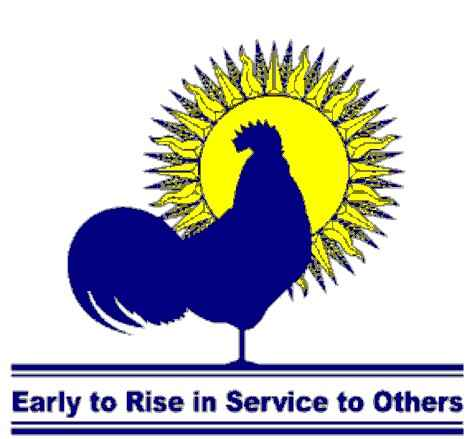 Rotary clubs have, once more, joined hands to come together and help make a food empowerment programme for a group of women in Kenya a reality. 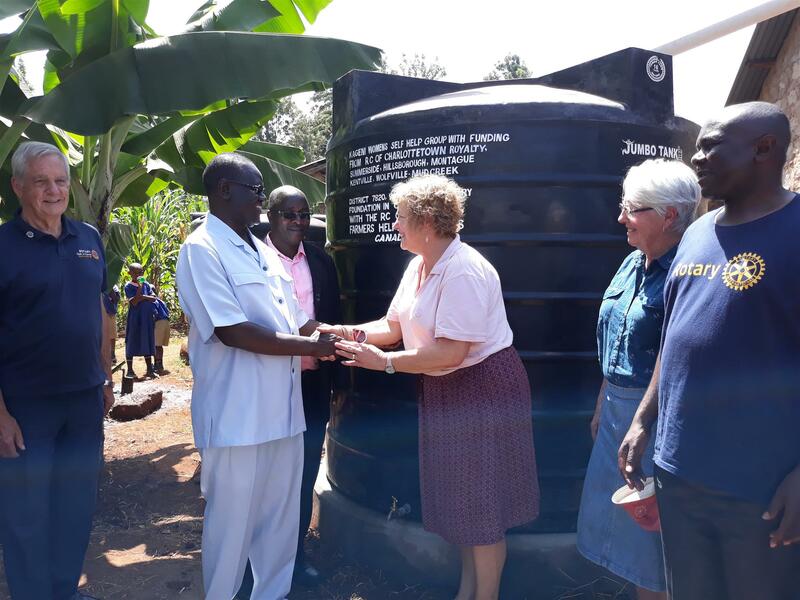 Under the leadership of Rotarians Winston Johnston and Tom Campbell, funds were sought from local and regional clubs as well as from the District and Rotary Foundation International to finance the purchase of water tanks for women in a small village in Nkubu, Kenya and provide training and resources for growing of vegetables. This is a $ 87,000 three-year programme, run in collaboration with Farmers Helping Farmers, whose members are on site to manage the project. Official launching of the project -Feb. 6, 2019. The RCCR recently donated $5,000 to the Family Violence Prevention Services "Building Brighter Futures Campaign". Pictured are Past President Joanne Ings, Valerie Docherty (Building Brighter Futures Campaign) and President Laura-Lee Lewis. 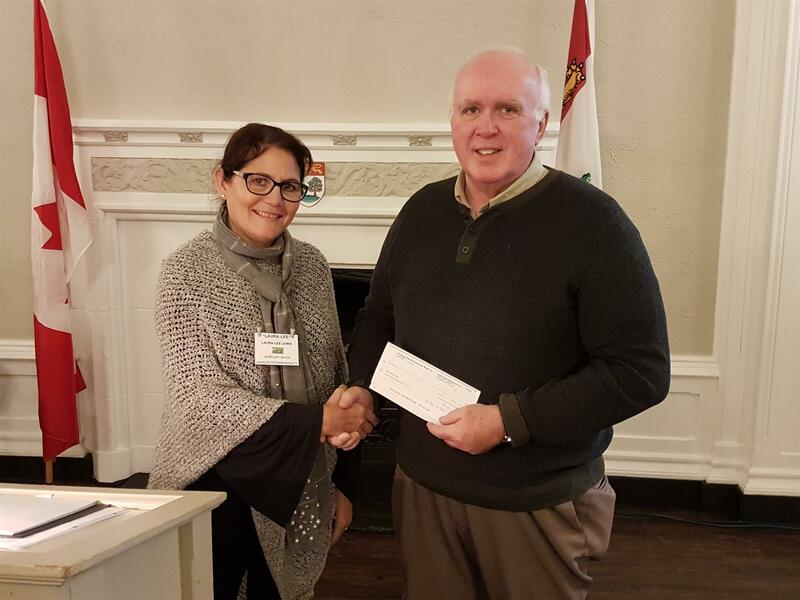 RCCR President Laura-Lee Lewis presented Myron Yates of Big Brothers, Big Sisters with a cheque for $30,000 for a teen mentoring program. The cheque was the second installment of the club's $90,000 commitment over three years. In the Teen Mentoring Program, teens in high school are matched with elementary school students to give the younger student a mentor and role model. 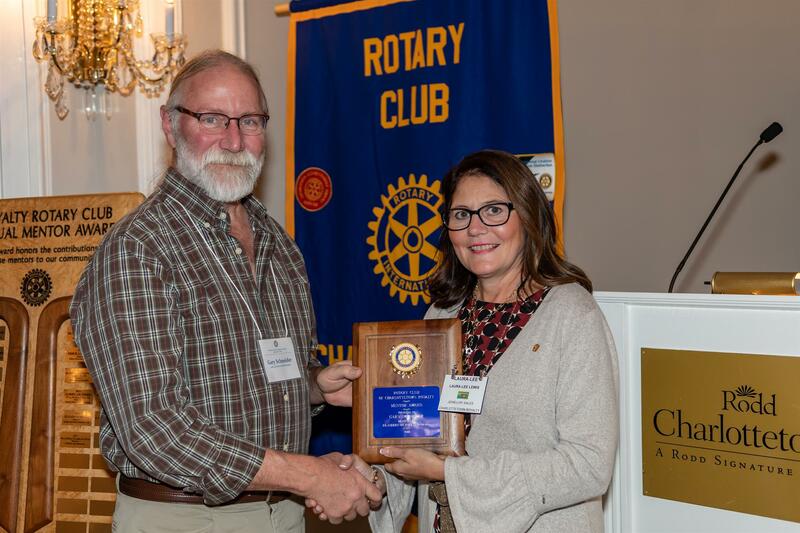 Each year the Rotary Club of Charlottetown Royalty presents a Mentor Award to a member of the community who has been a mentor to others in a specific field. At a special dinner meeting the club presented the 2018-19 Mentor Award to Gary Schneider, Mentor to Islanders on Forest Ecology. For more information, click here.